How Many Rent-Regulated Units Are Rented at Preferential Rates and Where Are They Located? It is commonly assumed that rent regulation limits the amount owners can charge tenants, keeping rents below what the market would otherwise command. Yet for thousands of apartments across the city, landlords charge their tenants rents that are lower than the maximum allowed under rent-regulation rules. This is known as a preferential rent. While landlords will sometimes forgo additional permissible rent to retain a reliable tenant, in neighborhoods where there are large shares of tenants paying preferential rents, it is an indication that local market rents are not constrained by rent regulations. Using apartment registration data from the New York State Division of Housing and Community Renewal, IBO found that of the 765,354 state-registered units subject to the traditional rent-regulation rules in 2013 (the most recent data available), 23 percent—more than 175,000 apartments—were rented at a preferential rate. Click on a neighborhood to see number of rent-regulated apartments and share with preferential rents. Neighborhoods with some of the highest shares of tenants in regulated units paying preferential rates were Oakwood in Staten Island (62 percent), and Fresh Meadows and Bay Terrace in Queens (61 percent and 60 percent, respectively). The overall number of regulated units in these areas, however, was small. In neighborhoods with large numbers of regulated units, those with high shares of units receiving preferential rents include Flushing (38 percent), Astoria (35 percent), and Hunters Point-Sunnyside (34 percent). Some of the neighborhoods with substantial numbers of regulated units and the lowest shares of apartments with preferential rents include the West Village (10 percent) and the Upper West Side (10 percent). Outside of Manhattan, Borough Park (15 percent) and Prospect-Lefferts Gardens (17 percent) in Brooklyn had low shares of preferential rents. The prevalence and extent of the rent preference varies among the boroughs. 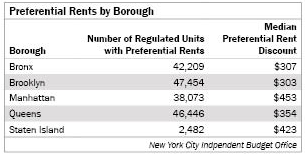 Brooklyn had the largest number of regulated units receiving preferential rents, followed by Queens. In terms of the median preferential rent discount—the difference between what the tenant pays and the maximum legal rent the landlord could charge under rent regulation—apartments in Manhattan had the largest median discount, while units in Brooklyn had the smallest. The fact that in some parts of the city more than a quarter of units receive preferential rents indicates that rent regulation is not always the most important factor in determining a tenant’s rent. Barring substantial increases in market rents in the neighborhoods with large shares of regulated units with preferential rates, continued regulation might not make much difference in determining the cost of housing for tenants in those areas. NOTES: A total of 862,254 regulated units were registered with the New York State Division of Housing and Community Renewal in 2013, approximately 84 percent of the total estimated number of rent-regulated units in the city. A total of 96,900 units added into rent regulation after 1974 in exchange for certain financing benefits, such as the 421-a and 421-g tax incentive programs, were excluded from this analysis. How Much Do Public School Budgets Vary Across the City’s School Districts and Boroughs? There is a great deal of variation in average per pupil allocations across community school districts. In 2013-2014, the last school year in which budgets were set by the Bloomberg Administration, school district allocations averaged $8,255 per student in grades pre-k through 8. The difference in per pupil allocations between the district with the highest average allocation (district 16, Bedford-Stuyvesant) and the lowest (district 24, Corona/Elmhurst) was $3,800. This variation is not unexpected. Schools recieve funding from a variety of state, city, and federal sources, many of these funding streams attempt to direct resources to students deemed to have greater needs. Moreover, per pupil spending is also a function of school size, with large schools generally receiving less funding per pupil than schools with fewer students. Some part of the difference in allocations relates to the relative socio-economic status of the communities within each district. The largest per pupil allocations are found in the South Bronx (district 7), Central Brooklyn (district 16), Upper Manhattan (districts 4 and 5), and the Lower East Side (district 1). 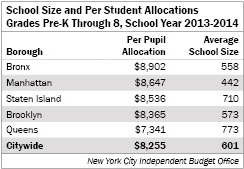 The lowest per student allocations are found in Queens (districts 24, 25, and 26) and Manhattan (district 2). The results displayed by borough and funding source shed more light on these differences. The three largest funding streams for schools, Fair Student Funding, other city funds, and Federal Title 1, drive the major difference across boroughs. Schools in Queens receive, on average, $1,310 less per pupil from these combined sources than schools in the Bronx. School size also contributes to the differences in per pupil allocations across districts and boroughs. Generally, large schools receive less funding in per pupil terms than small schools. This is likely because schoolwide costs are being shared over a greater number of students. Queens, with the largest average school size, had the lowest per pupil allocations, while Manhattan and the Bronx, with the two smallest average school sizes, had the two largest per pupil allocations. NOTES: Excludes high schools and schools in the citywide special education district (district 75) because they are not evenly distributed across community school districts. Spending allocated to school budgets exclude fringe benefits.